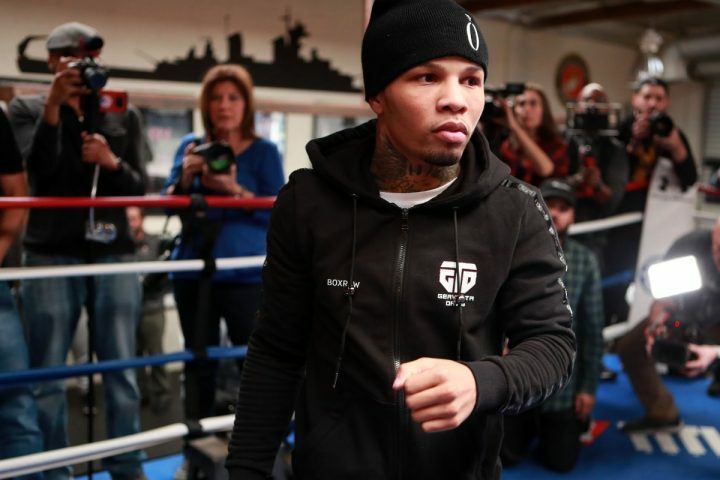 By Mike Smith: Gervonta ‘Tank’ Davis says he’s noticed a certain swagger and self confidence coming from his opponent Hugo Ruiz ahead of their fight this Saturday night on SHOWTIME Boxing at the Dignity Health Sports Park, in Carson, California. Davis (20-0, 19 KOs) seems more amused at the 32-year-old Ruiz’s attitude than worried about it. There is absolutely no worry at all in the 24-year-old Gervonta’s facade when talking about the cockiness of his opponent Ruiz (39-4, 33 KOs). Davis isn’t looking past the hard hitting WBC super bantamweight champion Ruiz. Davis knows the tough Mexican fighter won’t be an easy fight for him, but he’s also not making more out of this fight than what it really is. Ruiz is a replacement opponent to fill in after the originally scheduled opponent former three division world champion Abner Mares pulled put of the fight this Saturday’s fight with Gervonta due to a detached retina of his left eye. Davis still wants to fight Mares, but later on at some point. Gervonta will be defeating against Ruiz this Saturday night on February 9 LIVE on SHOWTIME at the Dignity Health Sports Park, in Carson, California. This venue was previously named the StubHub Center. “I get that from him, he cocky. So he better be ready,” Gervonta ‘Tank’ Davis said on Wednesday talking to he media about his title defense against replacement opponent Hugo Ruiz on Saturday night. Even though Ruiz is a former WBC 122 lb world champion, the boxing public views him as food for Tank Davis, and they see this as a WEAK main event on Saturday night. You can’t put too much blame on Davis’ promoters at Mayweather Promotions. The injury for Mares, 33, left them no time to dig up a replacement opponent at super featherweight. So they did a good job of finding a highly ranked contender from the featherweight division. Clearly, it would have been better if a top contender from the super featherweight division was found for Gervonta to fight this Saturday night on SHOWTIME, but there aren’t too many talented contenders that would be willing to take on Gervonta on one week’s notice. Gervonta isn’t worried at all that he’s facing Ruiz on short notice, and hasn’t had a lot of time to prepare for him specifically. Davis, 24, feels that he’ll make the adjustments that he needs to during the fight to deal with whatever Ruiz brings to the table on Saturday night. It kind of looks bad that Davis’ replacement opponent is from the 126 lb division, the weight class below the one he campaigns at in the super featherweight division. That was the criticism that Gervonta was getting from boxing fans for him originally scheduled to fight Abner Mares, who was moving up in weight from the 126 lb division to face him at 130. Now that Mares has pulled put of the fight, Davis is facing another fighter from the featherweight division in Ruiz. That’s not a good look for Gervonta. The boxing public wants to see Davis fight guys in his own weight class at super featherweight. Many of them already see Davis as a weight bully, because he blows up between fights and looks really big, much bigger than the average 130 lb fighter. Just how much longer Davis can continue to make the super featherweight limit is unclear. He’s supposed to be moving up to lightweight to go after Vasyl Lomachenko. Davis should have made that move already, considering he’s wasting his time fighting in the 130 lb division if his promoters at Mayweather Promotions are going to be having him defend his WBA 130 lb division against featherweights one after another. Davis’ last opponent Jesus Marcelo Andres Cuellar was a featherweight as well. Davis used his size to obliterate Cuellar in three rounds. It’s unclear whether Gervonta is intentionally being matched against featherweights for him to look outstanding each time or if his is just a coincidence. With the way boxing is now, Davis will be lucky if he gets even one of those fighters to face him. It’s not realistic for Davis to get any of those fights anytime soon if ever. Maybe if Gervonta starts looking vulnerable in his fights, he could get the promoter or manager for one of those guys to pull the trigger on a fight against him, but definitely not now. Gervonta is too good. It would be a good move for Davis to vacate his WBA Super World super featherweight title after Saturday night’s fight with Ruiz, and move up to lightweight to go after one or more of the belts. There’s some good fights in the 135 lb weight class for Gervonta to make. Of course, Mayweather Promotions will need to be willing to reach out to Top Rank to make a fight between Davis and Lomachenko, but it’s a doable one. Top Rank would likely be more than willing to make the Lomachenko vs. Davis fight in 2020. Right now, Top Rank seems interested in having IBF/WBA 135 lb champion Lomachenko fight IBF lightweight champion Richard Commey on April 12 in a unification. But if Davis moves up in weight to lightweight, he could put himself in line for a world title almost immediately against Lomachenko if he wants that fight. It would be a lot better move for Davis than staying at 130 and continuing to fight aging 126 lb fighters like Ruiz and Mares. Davis can do a lot better than that if he wants to come a pay-per-view attraction in boxing. Davis might be wasting his time by fighting smaller guys from the divisions below him instead of popular guys from his own weight class.